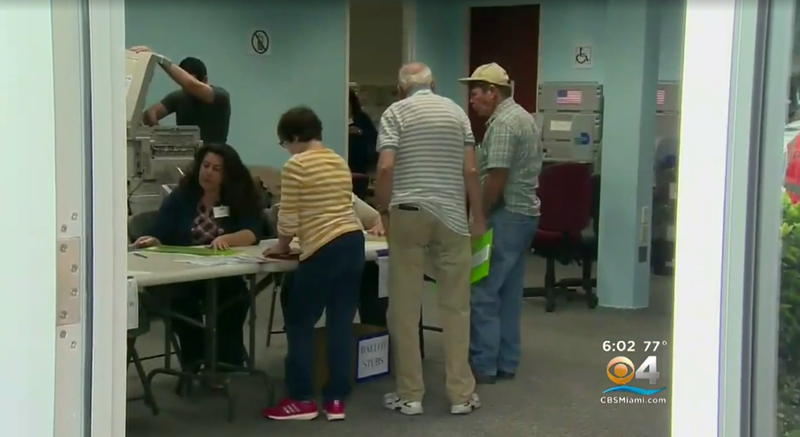 MIAMI -- Just days into Florida’s election process, two women have been busted in separate cases of violating the state’s election laws, CBS Miami reports. Gladys Coego, 74, a temporary Election Support Specialist for the Miami-Dade Elections Department tasked with opening mail-in ballots and scanning them into the machine, is accused of marking ballot choices that were originally left blank, according to CBS4 News partner The Miami Herald. She was allegedly caught red-handed by colleagues on Tuesday filling in ballots favoring Miami-Dade mayoral candidate Raquel Regalado. Investigators have initially determined that Coego has no affiliation or link with the Regalado campaign, however. In a second arrest, police said Tomika Curgil, 33, filled out voter-registration forms for five citizens without their consent and submitted at least 17 forms for people believed to not exist, including several who are dead. Authorities said Curgil was hired as a canvasser to register voters for People United For Medical Marijuana. Curgil was charged with five counts of submitting false voter-registration information. Coego was charged with two counts of marking someone else’s ballot. Both are 3rd degree felonies. Coego’s arrest comes a day after Regalado, a Republican, filed suit against Republican incumbent Miami-Dade Mayor Carlos Gimenez, attempting to disqualify him under an election payment technicality. Coincidentally, the incidents highlight repeated claims from Republican presidential candidate Donald Trump of “election rigging” by his opponents and the media. Though, from the billion votes cast since the 2000 election, only 31 cases of voter fraud have been documented, a report from The Washington Post discovered, showing smaller, isolated pockets of election abuse, rather than systemic or widespread rigging. Both cases were investigated by a joint public corruption task force, consisting of police officers from several county jurisdictions, including Miami-Dade, Miami, Miami Beach, Doral and the Miami-Dade school district.